Carno Station Action Group were delighted to meet Regional Assembly Member Eluned Morgan last week to discuss the case for reopening a station in the village. Group Chairman, Jeremy Barnes, said “We are really pleased to have this opportunity to discuss the problems with Eluned. After taking the station reopening forward so far we were becoming concerned about the lack of progress in recent months.” Following lengthy discussions and correspondence great progress had been made with the previous Assembly Minister responsible, Edwina Hart, but after she stood down at the recent election it has taken time for the new Minister to respond to the group. The Campaign Group discussed the background and specific issues with Ms Morgan, who agreed to go back to the Assembly to take the matter up. Local politicians of all parties have given the campaign their support. Transport Minister Edwina Hart has confirmed Arriva Trains Wales and Network Rail have broadly agreed with an independent report recommending opening a station at Carno in Powys. The BBC have done a News report along with a short video interviewing Jeremy Barnes, Clem Richards, and Russell George AM. Click HERE to see the full article on the BBC news website. Mr Barnes went on to say “We aim to knock on every door in the village and to contact residents living in outlying houses.” A consultation document has been prepared setting out the options for a new platform and shelter at the former station site and a new site at the other end of the village. Members of the group are currently in detailed discussions with officials over the costs and benefits of the station. They point to the contrast between the number of stations opened in South Wales in recent years and the absence of new stations in Mid Wales. The proposal for a station in Carno continues to receive support from Assembly Members of all parties. This is excellent news, as not raising the car park will reduce the station cost by about a quarter of a million pounds to under £1.5 m and, as a result, significantly improving the station Benefit Cost Ratio. As was made clear at the public meeting in November, TraCC, the Regional Transport Consortium, want to build the station but have no funding to do so. This is because the Welsh Government gave them no funding to match their new responsibility for Regional rail infrastructure. 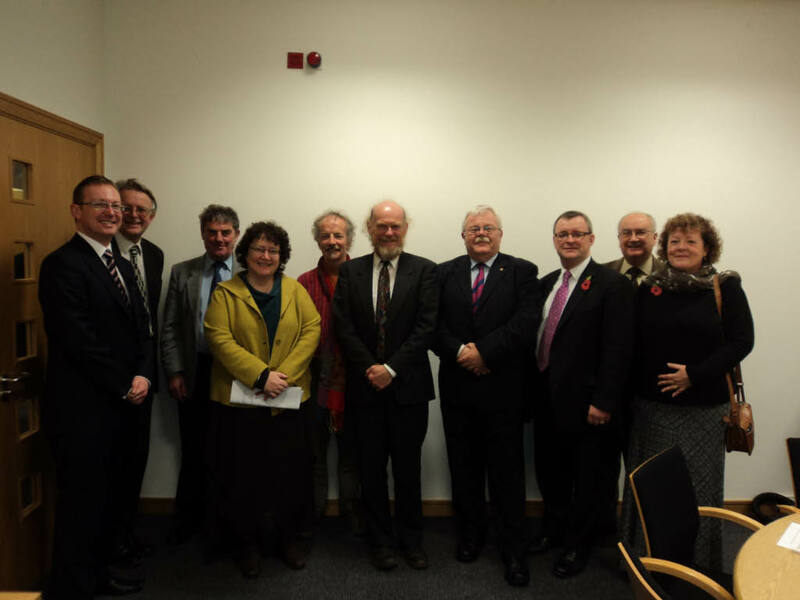 TraCC met with the Minister on March 5th to try to clarify matters and at the next Board meeting on March 23rd Chair Trevor Roberts announced that TraCC now “knows where it is going” on the funding of Regional Rail Schemes. Accordingly Cllrs Rachel Davies, Michael Williams and Gwilym Evans wrote to the TraCC Chair in April asking him to set out his new understanding of the funding arrangements, but no reply has yet been received. At the TraCC Board meeting on March 23rd, we had sight of the TraCC 5 year Regional Transport Plan 2011/2 – 2015/6 (Final 10th February 2012). This includes £425 k worth of “development work” expenditure in 2014/5 and 2015/6 followed by £1.7 m for station construction in 2016/7 – all with the caveat “Rail projects funding is uncertain and therefore not confirmed as items within the RTP”. The TraCC 5 year Regional Transport Plan 2011/2 – 2015/6 (Final 10th February 2012) also appeared in a briefing document distributed to the new TraCC Board before their meeting on July 13th, but in this version all reference to rail schemes had disappeared. As TraCC had not briefed us about the plans for Carno – albeit tentative – in the earlier issue of the 10th February 2012 version of the 5 year Plan, CSAG decided that a formal meeting with TraCC was long overdue and in May asked Simon Thomas AM to convene such a meeting involving other AMs as well. Following the May council elections, chairmanship of TraCC has rotated to Powys and Cllr Barry Thomas has been elected to chair. He attended the June 22nd CSAG meeting before his election to the TraCC chair and was clearly interested in the station proposal. More recently Cllr Thomas has asked Steve Holdaway, a PCC officer, to arrange a meeting with us “to address your concerns even if we are unable to resolve them”. It is hoped that a date for this meeting will be set shortly. Our Chairman has made it clear that we would like our local and regional AMs to be invited. Clearly our main obstacle is funding. At our request, the Chair of the Enterprise and Business Committee, Nick Ramsay, wrote to the Minister for Local Government and Communities, Carl Sargeant, posing a number of questions on this issue. The Minister duly replied, but side stepped one crucial question, so we still do not know the Minister’s justification for transferring responsibility for regional rail infrastructure to TraCC without parallel transfer of the requisite funding stream. Although we have pointed this out to Mr Ramsay, he is not optimistic about being able to get any further on this issue. Despite this, there has been a much more hopeful statement from the Minister himself in the Senedd recently. In reply to a question from Elin Jones he said, in relation to Carno and Bow Street stations, that “if this is a scheme that TraCC believes is one of its priorities, it should apply to me for the appropriate funding.” Over to TraCC, then? There have been some important changes in the Action Group since June. Cllr Graham Jones, the new councillor for Trefeglwys, has joined the group in place of Cllr Gwilym Evans. We would like to thank Gwilym for his long standing support and we wish him a long and contented retirement. Also the new councillor for Llanbrynmair, Dai Jones, has signalled that he wants to support the campaign and has joined our group as well. These are both welcome developments. There have also been some changes in members’ rôles. Jeremy Barnes has taken over as chairman since Tony Burton’s move to London and Barry Long has taken on the tasks of Secretary and Press Officer. Bernard Evans has agreed to be Progress Chaser in addition to sending out Supporters’ Newsletters. Alan Humphries has taken over as Treasurer from Myra Channell, to whom our thanks are due, and Rob Ritchie and Pippa Scott have taken over responsibility for the deployment of the “Gorsaf Carno Nawr!” sign. If anyone else would like to help (and help is certainly needed as the action hots up), please contact Jeremy on 420712. Hopes for a new station in Carno were given a major boost on Monday November 14th, 2011, when a capacity crowd in Carno Community Centre were told the station could be opened within three years. About two hundred people packed into the hall to hear a presentation of the station Business Case by Chris Wilson, co-ordinator of TraCC, the Regional Transport Consortium. Summing up, he noted that, although public transport provision in rural areas was vital for social and environmental reasons, it was often difficult to justify in strict financial terms, because of low population levels. However, in the case of Carno station, a relatively high level of demand had been predicted, resulting in a more than acceptable Benefit/Cost Ratio. Following the Business Case presentation, TraCC chairman, Councillor Trevor Roberts, told the audience, which included local Assembly Member, Russell George, that TraCC were fully behind the opening of Carno station and that, subject to resolution of funding with the Welsh Government, he could see no reason why the station could not open within three years. The full title of the business case report is “Carno and Bow Street Stations WelTAG 1+/2 Assessment”. WelTAG is included in the title as the assessment was carried out according to Welsh Transport Appraisal Guidance (WelTAG) The report is available on the TraCC website. 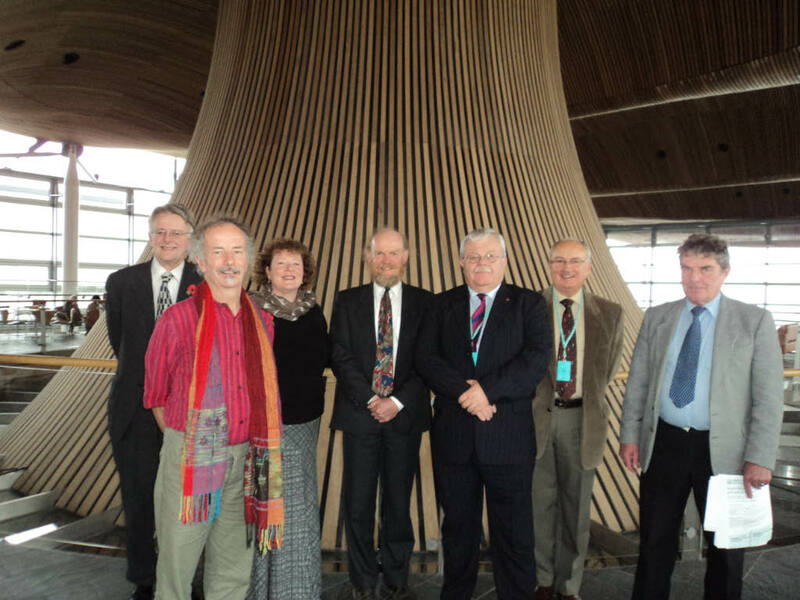 A joint delegation of Carno and Bow Street station campaigners travelled to Cardiff on November 8th and met with local and regional AMs to brief them before they, in turn, met the Minister, Carl Sargeant the following day. In the afternoon, the delegation met with Welsh Government civil servants. 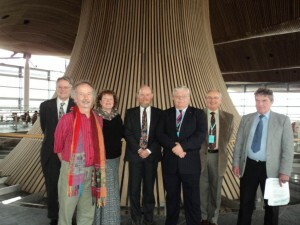 The photograph below shows members of Carno Station Action Group with Councillor Paul Hinge of Bow Street in the Senedd prior to this meeting. The meeting helped to clarify the relationship between the National Transport Plan (NTP) and the Regional Transport Plans (RTPs). The delegation learned that the NTP is not the sum of the RTPs as some had understood. Instead, the NTP contains projects of National significance while the RTPs contain projects of Regional significance. This is of key relevance to the station plans, as new stations are considered to be schemes of Regional rather than National significance. Accordingly it falls to the Regional Transport Consortia to prioritise new stations rather than to the Welsh Government. The rapid rise in fuel prices over the last few years considerably strengthens the financial case for the opening of new railway stations, according to research by Carno Station Action Group. The business cases for Carno and Bow Street stations recently completed by Capita Symonds for TraCC are founded on Department of Transport advice that the real price of petrol – ie the retail price corrected for inflation – rises at only 0.2% a year, whereas in fact it has gone up at an average of 3% a year over the last nine years. On the cost side, Carno Station Action Group point to the use of unrealistically high station operating costs as detracting from the station business cases. A figure of £35,000 per year has been used for each station – enough to employ a full-time stationmaster at each, when the stations are intended to be unstaffed! By comparison, the business case for the proposed Energlyn station near Caerphilly, which is to have two platforms, quotes an operating cost of only £23,500 per year. No evidence has been provided to support the £35,000 per year station operating cost figure and CSAG believe that the cost should be half this at most, in view of the small size and rural situation of each station. Members of Carno Station Action Group were delighted to learn at the end of April 2010 that the detailed study of the case for Carno Station – WelTAG Stage 2 – is to go ahead shortly. Carno station performed well among the various improvement schemes considered in the recently completed Rail Utilisation Study commissioned by TraCC, the Regional Transport Consortium for Mid-Wales, with the result that TraCC recommended that it go forward for detailed appraisal. In accepting TraCC’s recommendation, senior officers from the Welsh Assembly Government attending a meeting in Newtown on April 27th said that the detailed study would start as soon as possible, and be carried out over the summer. They added that they would like to see a dialogue between CSAG and the consultants carrying out the appraisal, to take advantage of the work CSAG had already done. Once the study was finished, the Welsh Assembly Government would be in a position to decide whether to include the station in its Rail Forward programme. Carno residents joined members of the Action Group and Assembly Member Mick Bates to celebrate this important milestone at a coffee morning held in Carno Community Centre on Saturday May 8th.